ISLAMABAD/LAHORE/KARACHI: With the Pakistan Tehreek-i-Insaf poised to form the new government at the Centre, all other major parties across the country have cried foul over attempts to rig the elections and blamed the Election Commission of Pakistan for failing to conduct transparent polls. As the vote count was still under way, the Pakistan Muslim League-Nawaz — the main contender to the PTI — rejected the election results and said a puppet mandate to Imran Khan’s party was not acceptable to it. The Pakistan Peoples Party (PPP), Muttahida Majlis-i-Amal (MMA), Muttahida Qaumi Movement-Pakistan (MQM-P), Tehreek-i-Labbaik Pakistan (TLP), Pak Sarzameen Party (PSP), Pakhtunkhwa Milli Awami Party (PkMAP) and Balochistan National Party-Mengal (BNP-M) raised almost similar complaints of foul play. Although PTI workers and supporters started celebrations before the final results, no statement — or even a tweet — was issued by Mr Khan on his victory till early Thursday. However, his spokesperson Naeemul Haque tweeted that the PTI chief would “address the nation” on Thursday at 2pm “in celebration and recognition of the massive support received from the people of Pakistan in the 2018 elections which was a contest between the forces of good and evil”. Other parties claimed their polling agents were forced out from polling stations without being provided with Form 45 (the statement of vote count) by presiding officers after the polling ended peacefully in most parts of the country at 6pm on Wednesday with no major incident of rigging reported during the day. The ECP secretary said that there was no conspiracy and pressure behind a delay in announcement of election results. “The delay is because of breakdown of the RTS [result transmission system], as all POs [presiding officers] had tried to send results through RTS,” he claimed. 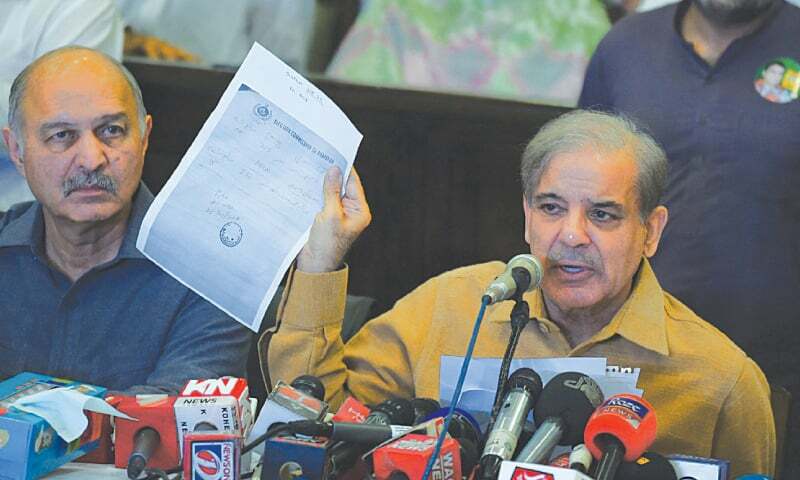 In a late-night press conference in Lahore, PML-N president Shahbaz Sharif rejected the results of the poll, alleging “blatant” rigging. “Rigging has been committed in the elections. The puppet mandate [to PTI] is not acceptable. We will only accept the people’s mandate. It is unfortunate that the people came out of their homes to cast the votes in such a harsh weather but their mandate was stolen,” he said. He announced that his party would adopt all available political and legal options, as “we cannot leave that matter like this”. 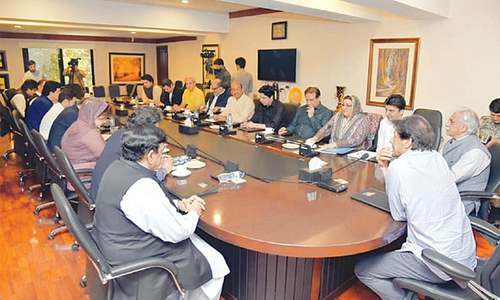 “The election commission has failed completely,” he said, adding that five other parties also complained of rigging and he would take them on board and after consultation with them to finalise a joint strategy. Speaking on the occasion, Mushahid Hussain Sayyed termed it the “dirtiest election” of the history of Pakistan. PPP’s Taj Haider and Mr Bhutto-Zardari spokesman Mustafa Khokhar questioned the role of security forces in forcing PPP’s polling agents out of the polling stations. Even Raza Rabbani warned of serious consequences of attempts to “manipulate and engineer election results”. The MMA chief and head of his own faction of Jamiat Ulema-i-Islam, Maulana Fazlur Rehman, also rejected the results. He said “unprecedented” rigging had been witnessed in the elections. Before Mr Sharif’s press conference, PML-N spokesperson Maryam Aurangzeb alleged that the counting process was being carried out behind closed doors, and changes were being made to Form-45. MQM-P’s Faisal Sabzwari said that his party’s polling agents were forcibly expelled from polling stations. He warned of staging protest sit-ins if any attempt to change the electoral result was made. PSP’s Raza Haroon said the eviction of his party’s polling agents had left a question mark over the transparency of the elections. MMA’s Hafiz Naeem also shared similar concerns when he told reporters that his polling agents were also forced out of polling stations without being provided Form-45 in Karachi. The Pakhtunkhwa Milli Awami Party (PkMAP) also rejected the results of the general elections. In a late-night statement, PkMAP leader Abdul Rahim Ziaratwal said that his party would launch a massive movement against rigging in consultation with other parties. But the ECP brushed aside the complaints that the polling agents had been forced out and Form-45 had not been issued to them, asking the parties to desist from levelling “baseless” accusations at this crucial juncture. “There was no such thing,” said ECP Secretary Babar Yaqoob Fateh Mohammad in Islamabad in an attempt to clarify the commission’s position. 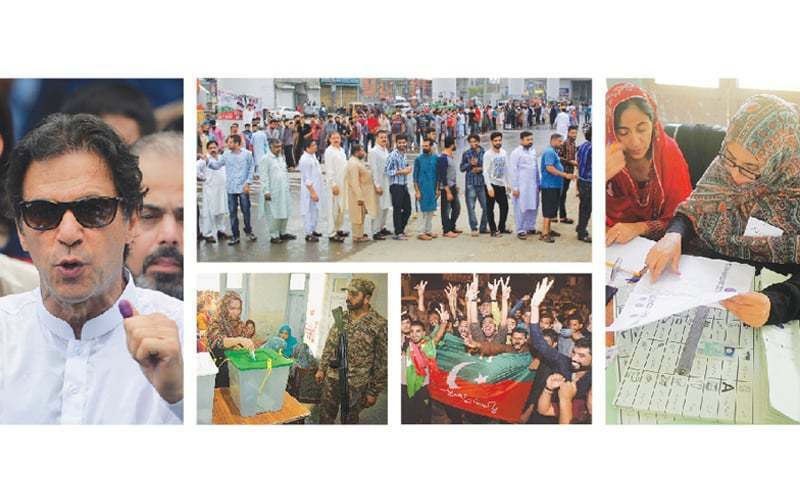 Earlier during the day, polling in Karachi, Rawalpindi, Islamabad, Lahore and other major cities slowly got out of their homes to vote in an election that was closely fought between the PML-N and the PTI. Tens of thousands of military personnel and policemen had been deployed across the country to ensure smooth voting. Troops were deployed to manage law and order inside polling stations. A slow, steady stream of voters, including women, started to build at the polling stations to cast their votes in the morning, but long queues were not seen in most cities till afternoon. The estimates of voters’ turnout differed from city to city, as well as within any given city or constituency. Overall voting took place in a peaceful environment except for the Quetta incident and reports of a few minor clashes between supporters of different parties. While the polling staff complained of insufficient resources, voters also found it difficult to locate their polling stations and other details since the ECP’s messaging service 8300 was working very slow. In Lahore, Kasur and Toba Tek Singh, minor clashes took place between supporters of the PML-N and PTI. No loss of life was reported from anywhere in Punjab. In Sindh, the polling process remained peaceful, but a few minor clashes took place in Badin and Dadu districts between activists of PPP, PTI and Grand Democratic Alliance (GDA). Khyber Pakhtunkhwa, which witnessed a number of terror attacks during the campaign period resulting in the death of two candidates, witnessed polling largely in a peaceful manner with a few incidents of violence reported from Swabi and Charsadda which resulted in the death of two people. Except a suicide attack in Quetta, polling in Balochistan took place in a peaceful manner. No major incident was reported from any part of the province except a few small clashes between supporters of candidates in the border town of Chaman, Duki, Nasirabad, Jaffarabad, Buleda and Panjgur. A rocket was fired on the outskirts of Buleda town, but no casualty was reported in the attack. In Karachi and Lahore, many people complained that their votes had been shifted to other areas, in some cases to other constituencies, without any justification. In Lahore, many voters complained of “slow polling process” and many gave up after waiting in queues for over two hours because of harsh weather. The slow voting speed made the PML-N to demand from the ECP by an hour and instruct the polling staff to expedite the process to allow everyone a chance to cast their votes. The demand was promptly rejected by the ECP. In Islamabad, the PTI chairman polled his vote at a polling station near his Banigala residence early in the day and held a news conference after polling the vote on which the ECP issued him notice. Cry foul, this is not the mantra the masses will listen to anymore, it is Naya Pakistan in making. You will see more and more of it in the future. The status quo has been buried for good. 6 major loosing parties crying Wolfe, they lost billions of dollars, what else they will say? NZ and PPP clans lost running business, they were in good alliance with each other.